The Wild Pack Band: Wild Pack on Jango Radio! Wild Pack on Jango Radio! 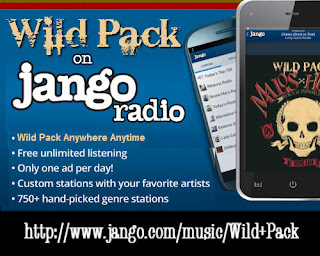 Now you can listen to Wild Pack anytime, anywhere on Jango Radio. Wild Pack's debut album Malos Huesos is now playing on Jango Radio. Jango is all about making online music easy, fun and social. With over seven million US unique visitors a month, Jango has grown fast to become the #5 largest music site in the US. In addition to Wild Pack anytime and anywhere, you'll get any of the music you want, along with similar favorites of Jango users who share your taste.